I recently came across this 1955 photo of Portsmouth Island native, Henry Pigott (1896-1971), from the Mike Riddick Photo Collection. 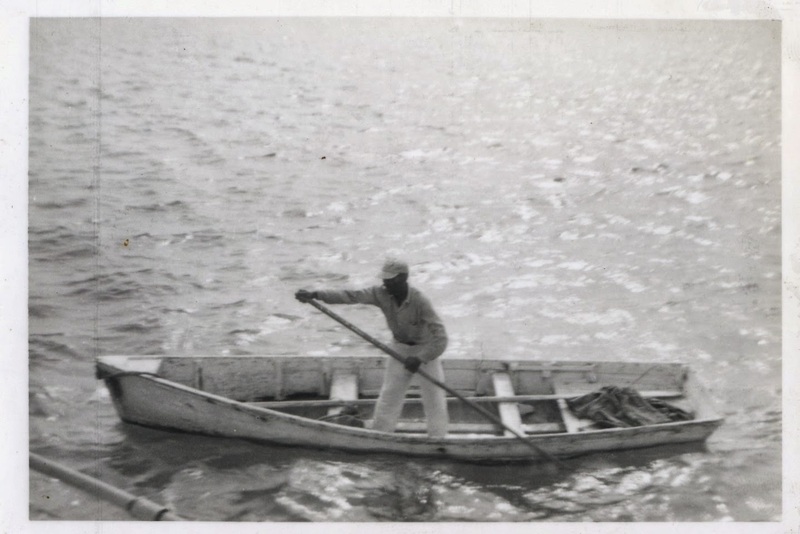 Henry poled his skiff out into Pamlico Sound every day to meet the mailboat. He retrieved mail and passengers, and gave the captain out-going mail and a list of items Portsmouth Islanders wished to have from Ocracoke. When Henry Pigott died, the other two residents of Portsmouth moved off the island. Pat Garber begins her chapter on "Barnacles: The Bane of the Seas" (in her book Ocracoke Wild) with this observation by nineteenth century naturalist, Louis Agassiz: "A little shrimp-like animal standing on its head in a limestone house and kicking food into its mouth." Pat goes on to explain that for a long time barnacles were believed to be mollusks. Now we know that these critters who foul pilings, anchor lines, and the bottoms of all vessels, from canoes to ocean-going tankers, are marine arthropods, relatives of crabs and shrimp. According to Popular Science magazine, "the U.S. Naval Academy estimates that biofouling creates enough hull-drag to increase the Navy's petroleum bill by about $250 million every year." For readers who might have missed DC's comment on today's earlier post, this 10-minute YouTube video is a great place to see footage of a periauger being constructed and sailed: https://www.youtube.com/watch?v=kgmvLCDZc2E. North Carolinians, including Ocracokers, relied heavily on two-masted flat-bottomed vessels called periaugers to transport goods on the rivers, creeks and sounds along the coast in the 18th & 19th centuries. In addition to sails (either gaff-rigged or Bermuda-rigged), periaugers carried oars so they could be rowed. Periaugers (sometimes called perogues) had no bowsprit, and were originally constructed from dug-out cypress logs. Later, the logs were sometimes split down the middle, and planks added between, to make a larger vessel. 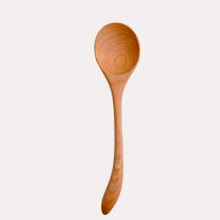 Some periaugers were constructed entirely of planks. The periauger was so common in Colonial America that it was not considered necessary to document the boat thoroughly. Unfortunately, steam-powered vessels eventually replaced periaugers so completely that no physical evidence of the vessels remained by the middle of the 20th century. In 2003, relying on extensive research and historical records, construction of a replica periauger was begun in Beaufort, North Carolina. This periauger, now berthed in Hertford, North Carolina, is the only known boat of its kind in the world. Follow these links for more information, and to see photos: http://beaufortartist.blogspot.com/2007/10/periauger.html and http://perquimansrestoration.org/Periauger_OVPE.html. Last week I began watching the seven-part film by Ken Burns, The Roosevelts, An Intimate History. Episode three chronicles Franklin Delano Roosevelt's appointment as Assistant Secretary of the Navy, serving under North Carolinian, Josephus Daniels, Jr. While watching the film, I was reminded that Josephus Daniels (1862-1948), at just two years old, was taken to live on Ocracoke after Washington, NC was burned during the Civil War. Until the war ended he lived with his family in a house (which is no longer standing) directly across the road from the Community Store. 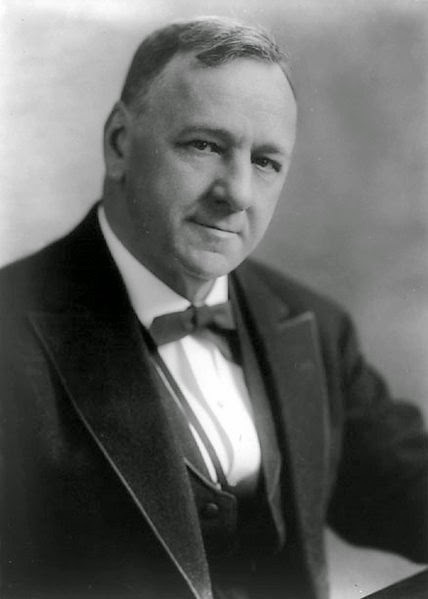 In 1913 Josephus Daniels was appointed Secretary of the Navy by President Woodrow Wilson. You can read more about Josephus Daniels and the Civil War in eastern North Carolina here: http://www.villagecraftsmen.com/news022112.htm. In spite of all the rain we've had recently, this is still an outstanding autumn! So often this time of year islanders and visitors are dealing with storms and hurricanes. Not so, this year. As I write there is not even a single "invest" (a future tropical depression) in the North Atlantic. (And I am not so superstitious as to think that my mentioning this might trigger a hurricane!). However, we have had rain, rain, and more rain for days. Howard Street & Lawton Lane are just a series of ever-larger puddles. This is a photo of my soggy yard (the water is up to the first step). So, we will all be happy when the rain finally stops. I am sure folks who are here on vacation right now are wishing they'd chosen a different week. But at least this is rain water, not tide water. We can all be happy about that. So reads the tombstone in the old George Howard cemetery on British Cemetery Road. Jonathan Price, in his 1795 map and article, "A Description of Occacock Inlet," writes that about thirty families were living on the island, and that one of the "original proprietors" had reached his "ninetieth year" and did not "appear to feel any of the infirmities of age." This was undoubtedly William Howard, Sr., one-time owner of Ocracoke Island. Nationwide, about 5% of the "above 65 year old" population of the United States is more than 90 years old. At the present time there are at least three island residents who are over 90 years old. We have just published our latest Ocracoke Newsletter. This month's article is about the Unionist North Carolina State Government that was established in 1861 right here on the Outer Banks, with Hatteras as capital! You can read all about it here: http://www.villagecraftsmen.com/news092114.htm. Rodney Barfield, in his book Seasoned by Salt, explains: "The Fresnel (pronounced Fre-NEL) lens developed by French physicist Augustin Fresnel, was a technological leap in navigational lighting. It is a glass dome of prisms and bull's-eyes, and light is concentrated at its center into parallel rays that are intensified with a magnifying glass." 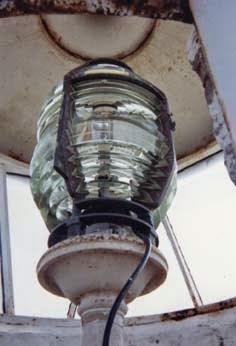 This is a photo of the fourth order Fresnel lens in the Ocracoke lighthouse. Although the Fresnel lens was invented in 1822, and the Ocracoke lighthouse was built in 1823, a Fresnel lens was not installed until 1854. The Ocracoke light (now produced by a 250 watt quartz-halogen bulb, and magnified by the lens) is equal to 8,000 candlepower, and is visible 14 miles to sea. 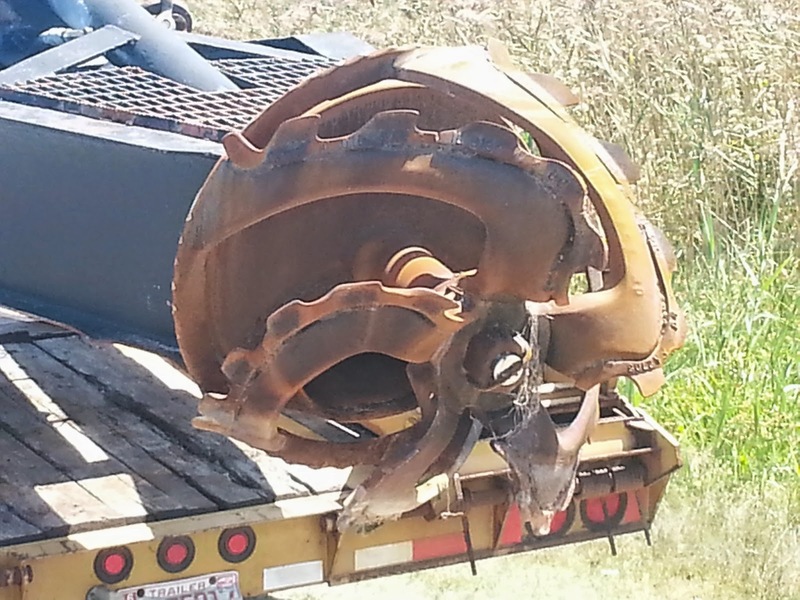 Many of our readers have seen dredges working in Hatteras Inlet or in the Swan Quarter/Cedar Island ferry channel. But I wonder how many have ever seen the dredge cutter head, the working end of the dredge that cuts through the bottom so the sand can be sucked up and deposited in the "hopper," cast over the side from a long pipe, or pumped through a pipeline to a "spoil island." The other day I noticed that a truck from Cape Dredging Company in Buxton, NC was parked in front of the Pub. 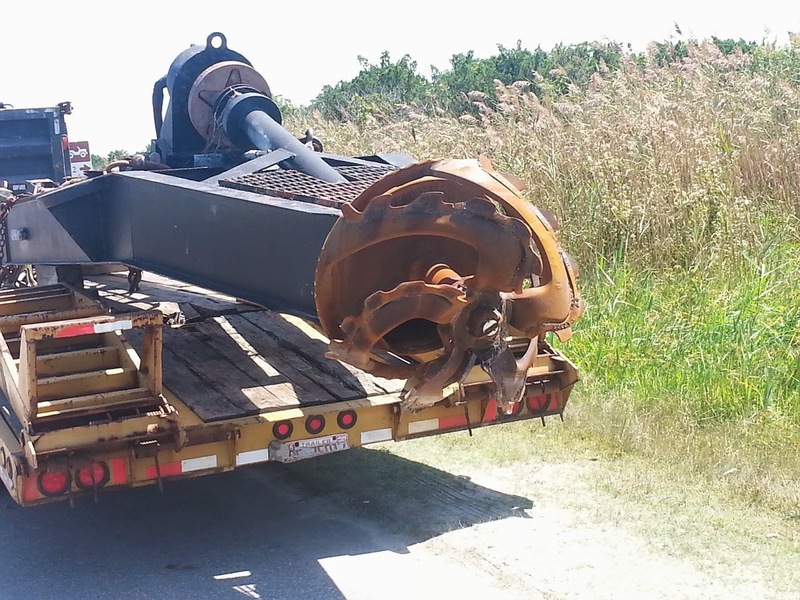 On the trailer was a cutter head. So I stopped and made a couple of photos for our readers. I subscribe to Google Alerts. Anytime Ocracoke is mentioned on the web I receive a notification. Recently I saw this headline: "Compare Crime Rates, New York, NY -- Ocracoke, NC." So I clicked on the link (http://www.bestplaces.net/crime/?city1=53651000&city2=53748740). I suppose the FBI has been investigating murders, rapes, burglaries, arson, and violent assaults on Ocracoke that I was just not aware of! How could I have missed this mayhem right under my nose? Isn't the Internet just wonderful. Well, shiver me timbers, today is "International Talk Like a Pirate Day." So dust off your cutlass, don a tricorn hat, or tuck a treasure map inside your dress (if you're not an Anne Bonney or Mary Reed, you might consider different attire)...and face the world of land lubbers like the buccaneer you know you can be. If you need a bit of encouragement, check out this web site: http://www.talklikeapirate.com/piratehome.html. Remember, talk like a pirate. You can do it! I recently received a copy of this photograph, taken about 1896. 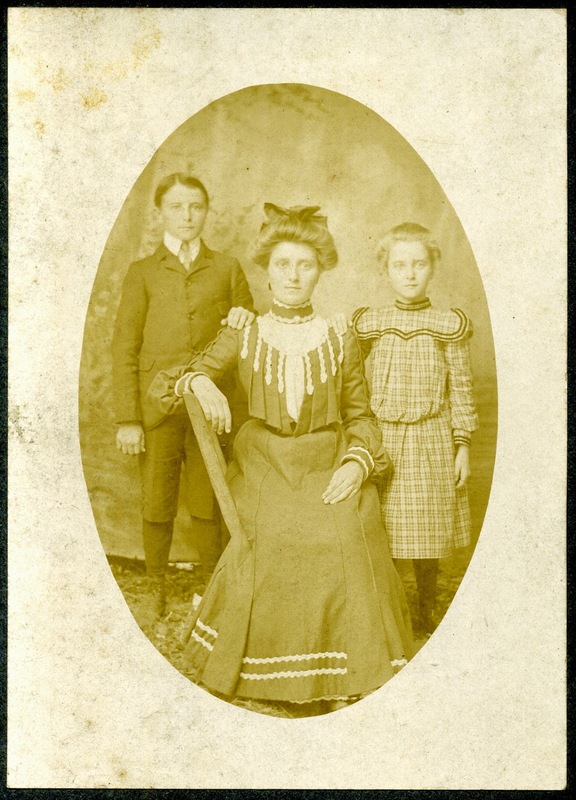 Seated is Lorena Howard Wyche, and two of her three children, Ira Thomas and Elsie Marvin. Ira's grand-daughter, Liz Williamson, sent me the picture. It was taken shortly before Lorena died. She was only 31 years old. Elsie continued to live on Ocracoke the rest of her life. 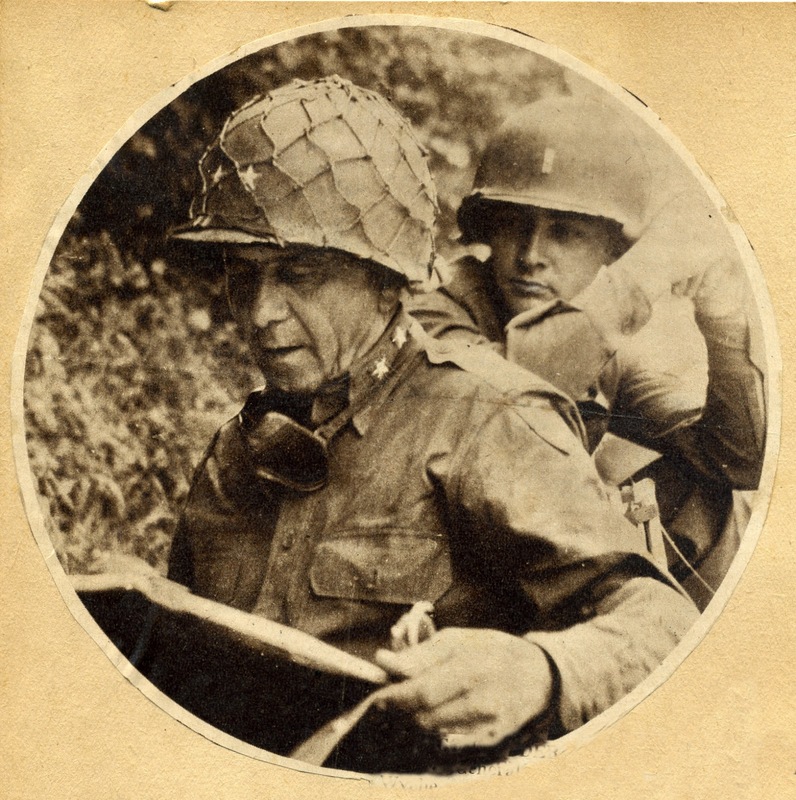 Ira went to West Point, and served in WWII as a two-star General. You can read General Wyche's story here: http://www.villagecraftsmen.com/news092110.htm. A recent issue of Time magazine ("The Answers Issue, Everything You Never Knew You Needed to Know"), includes some interesting statistics. Life is in large measure about choices. We islanders generally choose nature, community, and family over convenience, high-paying jobs, and proximity to shopping centers, fast food...even doctors and dentists. Island life is not for everyone. 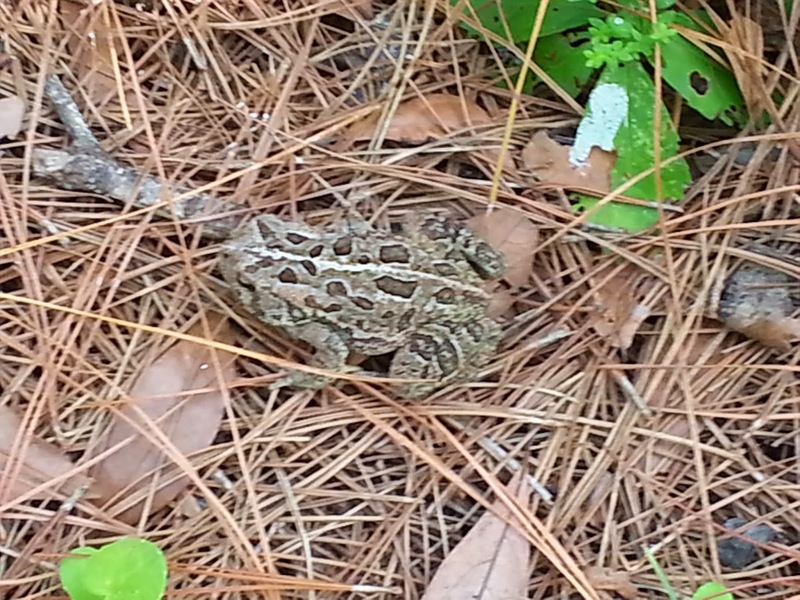 Sometimes toads are numerous on Ocracoke, and sometimes they seem rare. I think it might have a lot to do with storms and hurricanes. Many ground dwelling critters must die when high tides wash over the island. And it must take a while for the remaining individuals to reproduce, and for the species to recover. Lately I've seen a few more toads than I have for a while. This is reassuring. On Saturday the ocean was noticeably different. Lachlan and I went out to the beach in the morning for a quick swim, and stayed for an hour and a half. There were a few waves, but mostly the water was gentle and relaxing. Usually the water is a bit cloudy because constant wave action stirs up the sand. But Saturday the water was so clear that I could stand submerged up to my chin and still clearly see every one of my toes. Neither Lachan nor I wanted to get out of the water, but we reluctantly went home to have some lunch. I went back again in the afternoon! I recently came across this picture of the home of Rev. George Leffers (Leff) Fulcher (1838-1898) and his wife Cynthia Stowe Fulcher (1848-1913). They lived in Frisco, on Hatteras Island. The photo was reproduced in the book Fulcher Family by Ruth Fulcher Rickert. 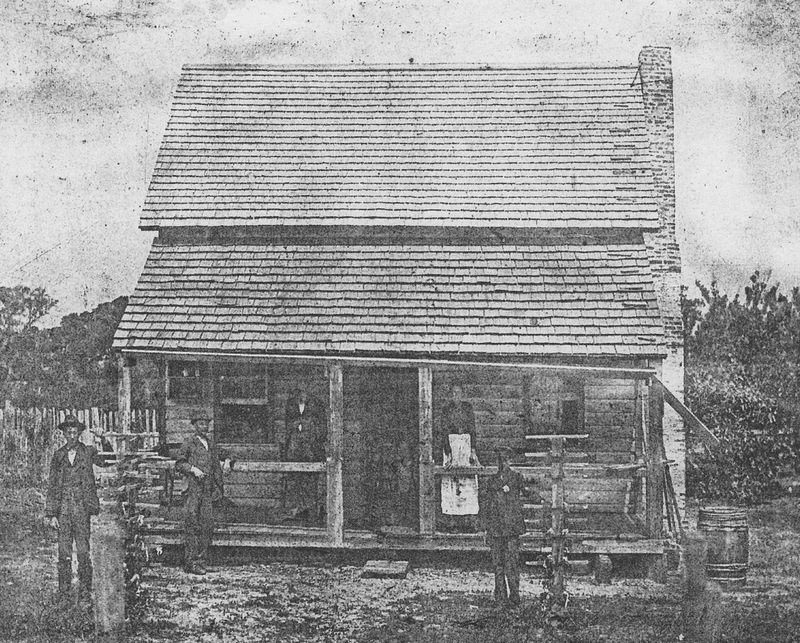 In addition to being a wonderful vintage photo of a typical Hatteras Island home before the outbreak of the Civil War, the picture includes two interesting objects in the front yard. If you look closely you will notice two posts about 6' high (a man is standing next to each one). You might want to enlarge the photo to get a better view (instructions on the right). Each post has about ten rows of sticks attached horizontally to the post at intervals of perhaps six or eight inches. It looks to me as if each row includes four sticks (two side by side, one on each side of the post; with two more directly on top of them at right angles). I have shown the photo to several Ocracoke islanders, but no one has ever seen anything like this before. My guess is that these objects were used for cultivating pole beans...or perhaps for drying fish. Any other guesses? Many of our readers know my house on Lawton Lane...a traditional "story and a jump," as they say in eastern North Carolina. These one-and-a-half story cottages were popular on Ocracoke from the mid- 1800s through the early twentieth century. A number of these iconic homes have been preserved on the island. 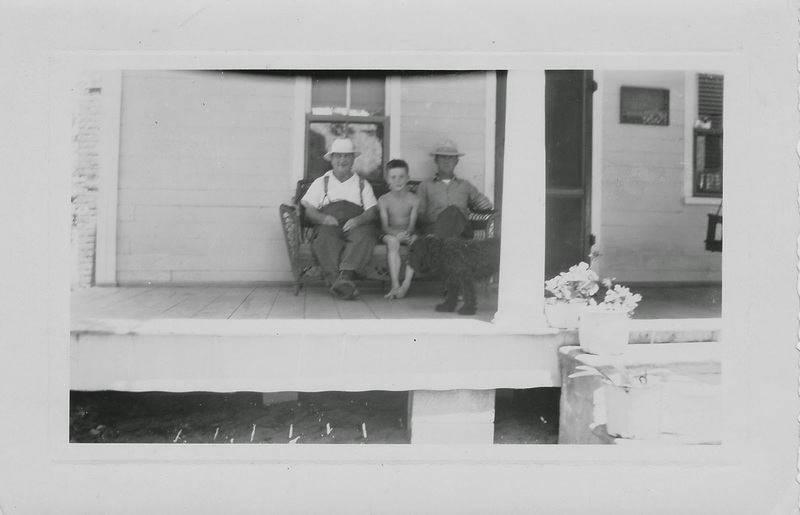 Below are photos of the Kugler Cottage, the first "summer" cottage on Ocracoke. Before you read the following, please take a look at yesterday's post about six young Ocracoke ladies in 1890. They placed an advertisement seeking young men "who can whirl in the giddy maze of the waltz," and were ready to "indulge in seaside flirtation without stint or reservation." "Good week for...Single men, after a feminist commune in Brazil that is populated by 600 women appealed for bachelors to move to the town. 'I haven't kissed a man for a long time,' said Nelma Fernandes, 23." It seems as if there is nothing new under the sun. Every time you turn around young women are looking for young men to add zest to their lives! So, take your pick...Brazil or Ocracoke. As the village girls sing to Blackbeard's pirate crew in Julie Howard's Ocracoke Island musical, A Tale of Blackbeard, "So, come on around, there's a lot to be found, at Euphemia's Boarding House." I will let this advertisement, published Sunday, August 10, 1890 in The State Chronicle, speak for itself. For Young Men Who Carry Their Brains in Their Heels. Six young ladies at Ocracoke, and as sweet and beautiful as the State can furnish, requests [sic] us to insert an advertisement for a dozen or two young men who can dance. They are ready, willing and waiting for an opportunity to whirl in the giddy maze of the waltz and to indulge in seaside flirtation without stint or reservation. Young men come to the rescue. Can accommodate ten guests. Terms per day 75c; per week $4.00. So read the advertisement in the August 4, 1891 issue of the Washington, NC Progress. Mary Gaskins Fulcher was married to William Henry Fulcher. 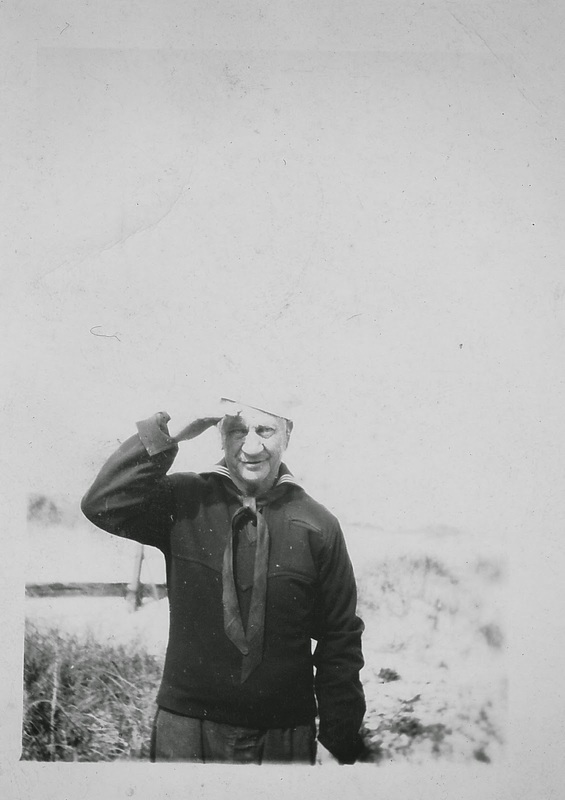 Their son, Frank Treat Fulcher, a sailor & preacher, was a colorful island character. You can read about Frank Treat here: http://www.villagecraftsmen.com/news052111.htm. Mary Fulcher's great-great grandsons, Rudy & Donald Austin, operate Portsmouth Island Boat Tours. Every once in a while, in the interest of Ocracoke Island history, I like to publish a typical recipe from years ago. The following is Elizabeth G. Howard's recipe from the "Green" Ocracoke Cook Book. Medium sized turtle. Remove shell, pour boiling water over meat to remove skin. Boil until it starts to leave bone. Remove bone and cut in pieces. Fry out salt pork, about 1/4 lb. cut in cubes, in the stew pot and when pork is crisp add turtle. Add 4 or 5 white potatoes quartered, 2 onions cut up, black pepper and pod of red pepper, 1 cup cooking wine, water to cover. Cook slowly for about 2 hours. When done add 2 hard cooked eggs cut up fine. Serve with baked corn bread. In late summer and early fall, when the ocean temperature is at its warmest, you might be rewarded by encountering a delightful display of phosphorescent protists that sparkle as you wade at the ocean's edge after dark. As Pat Garber writes in her book, Ocracoke Wild, these one-celled dinoflagellates are "among the most prolific life forms in the sea." She goes on to explain that the light, which is activated by darkness and turbulence, "is produced by special organs [actually vesicles called scintillons] which release luciferin, a complex protein which acts as a fuel in the presence of the enzyme luciferase." My most vivid memory of Ocracoke's bioluminescence is of a late night excursion into Pamlico Sound about 25 years ago. Two other friends and I had motored out in an inflatable dingy. As our craft cut through the water a wide swath of tiny flashing lights lit up around our vessel. We anchored between Ocracoke and Portsmouth, and jumped overboard. As we swam, the warm water of the sound came alive, completely surrounding our bodies with the sparkles of thousands of phosphorescent microscopic creatures. It was a magical evening, never to be forgotten! On this date in 1846 a powerful hurricane brought water from Pamlico Sound rushing across the Outer Banks and into the Atlantic Ocean. It cut both Hatteras Inlet and Oregon Inlet. Over the next several years, many Ocracokers, who were ship's pilots at Ocracoke Inlet, moved to the now more navigable inlet at Hatteras. 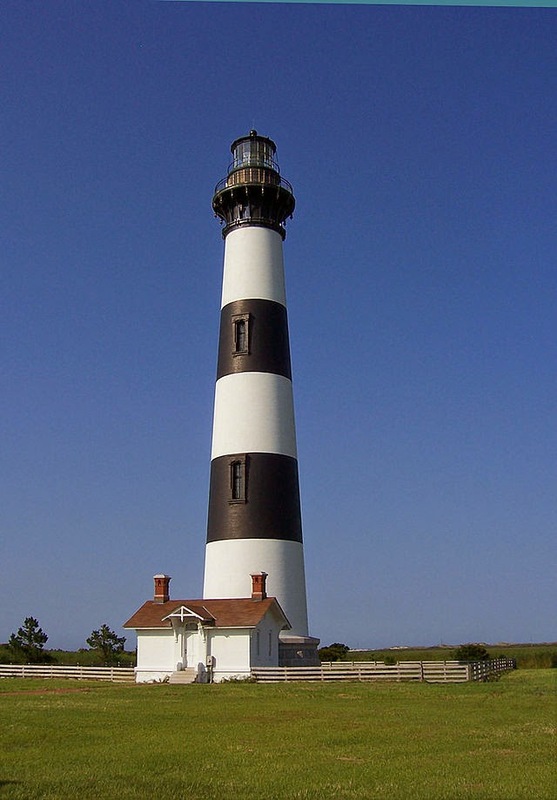 In 1872 the Bodie Island Lighthouse was built on the northern edge of Oregon Inlet. Illustrating the dynamic nature of the Outer Banks, Oregon Inlet almost immediately began moving south at the rate of about 100 feet per year. The Bodie Island Lighthouse is now about 3 miles from the inlet. With the construction of the Herbert C. Bonner bridge in 1962 the steady southerly migration of the inlet has slowed, but sand continues to flow into the inlet from the north, causing navigation problems (and constant dredging). I saw this hognose snake in August at the Hammock Hills Nature Trail. I came upon it abruptly, but couldn't get too close. It raised its head, then quickly slithered away as soon as I approached. I have had a smart phone for more than a year. I soon discovered that my phone has voice recognition software that allows me to send text messages more easily than typing them with my thumbs. "Wie gehts herr Schneider ich bin sehr gut." Later on I decided to see how accurately my phone would render Ocracoke English. This is what was entered: "Mornin' Buck. The tide is high on the sound side. Let's go fishin'." I guess my phone is not so smart after all! At 7:30 pm on Friday, March 27, 1891 the #4 surfman from Ocracoke's Hatteras Inlet Life Saving Station spied a ship too close to the beach. According to the keeper's official report, the surfman "burned coston Signal and running alond [along] beach to ascertain Her condition. Seeing that She not Heeded His Signal burned another coston Signal." When the surfman discovered that the ship (the 2-masted Spanish vessel, Borinquen) was in the breakers he "burned another coston signal." You might wonder what a Coston Signal is. Invented by Martha Coston in 1859, these signals are "a very ingenious and effective semaphore" that uses three lights (white, red, and green) which, in combination, can represent the numerals 0 through 9, and the letters A & P. The widowed Mrs. Coston used pyrotechnics to create a simple but effective flare that could be used for signaling between ships, or between a ship and the shore. Click here to read more about Mrs. Coston, and to view charts showing the codes used, and examples of the meanings of various combinations of letters and numbers. This web site also includes a visual that shows Coston Signals broadcasting the message P 2 9 3 A. As it turned out, the Life Savers pulled their 1000 pound apparatus cart (as the "sea ran over the beach") to the wreck of the Borinquen. "Progress was slow," and they arrived at the wreck at 9:30 pm. A "bad current [was] running abrest wreck," but the 27 crew members did not want to leave their ship. The Life Savers "stayed on beach in case that the ship should break up." They built a fire on the beach, and remained all night and through the next day, until 3 pm. Meanwhile, the ship's captain had called for a wrecking company to pull his ship out of the breakers. 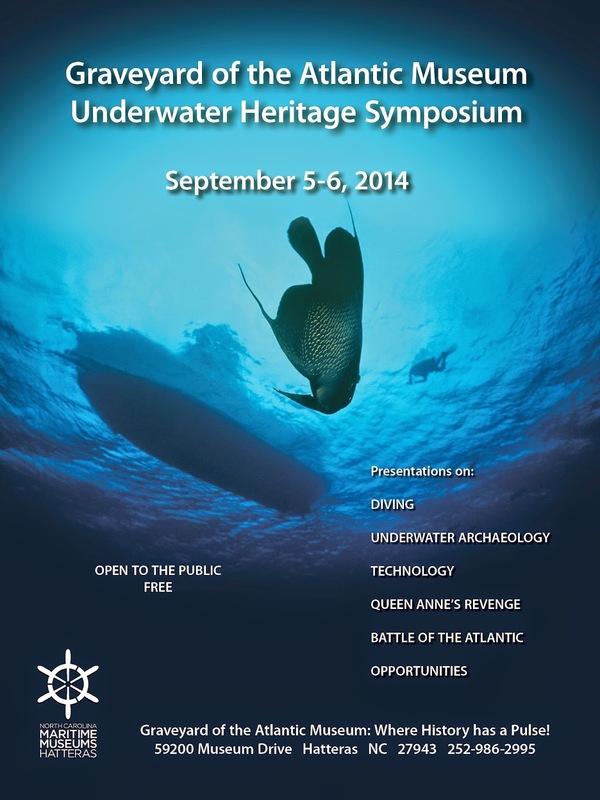 The Graveyard of the Atlantic Museum in Hatteras is sponsoring an Underwater Heritage Symposium September 5 - 6. The event features two days of presentations from leaders in the field covering subjects such as emerging technologies for marine science and ocean exploration, the "Queen Anne's Revenge" and Battle of the Atlantic projects, managing beach wrecks in the day of digital media and budget cuts, laws protecting underwater heritage, nautical archaeology training initiatives, the preservation of shipwrecks, and shipwreck diving experiences. The Underwater Heritage Symposium is free and open to the public. On Sunday evening from 5-7 pm Alan and Cary hosted a gathering of folks at the "Kugler Cottage" on Pamlico Sound. Everyone was there to cheer on the repair project for the skipjack Wilma Lee. As many of our readers know, the Wilma Lee was damaged during Hurricane Arthur, and a fundraising campaign is underway to pay the expenses (about $18,000) not covered by insurance. You can learn more about the Wilma Lee, Ocracoke Alive, and the fundraising effort here: http://www.ocrafolkfestival.org. Edward and Susan Norvel (pictured in the above photo with David Tweedie, President of Ocracoke Alive) have offered to match up to $5,000 in individual donations. Additional donations are still needed to pay for repairs. You can make a donation here. My Granduncle, Stanley O'Neal, lived on Howard Street. He was a kind old gentleman, born in 1885. He worked as the cook at the US Coast Guard Station. By the time I was a youngster Uncle Stanley was almost deaf, but he still enjoyed listening to records on his Victrola. He died in 1956, when I was 12 years old. This is picture of Uncle Stanley (on the left), me, and my father, taken about 1951 or 1952. This is Uncle Stanley's gravestone, near Cutting Sage Road. And this is a recent photo of Uncle Stanley's house on Howard Street. Now owned by Elizabeth and John Rinaldi, Uncle Stanley's house is a comfortable rental cottage. There is more information here: http://www.ocracokeislandrealty.com/OuterBanks/VacationRentals/Ocracoke/Details/Dc40_GaskinsOneal/.